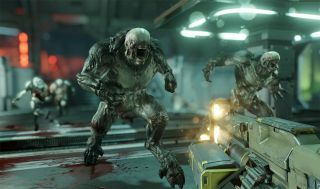 The focus on the Bethesda's Doom reboot has been almost entirely on the multiplayer action, but there is a single-player campaign in there too. A reminder of that fact turned up today in a video posted to Reddit that is purportedly a "canceled/unfinished" trailer for the game. It obviously isn't an official release, and it might actually be old material: The game is referred to as "Doom 4" in the video label, and "Fight Like Hell" is the title of the live-action teaser Bethesda released a couple of months ago. But it does look legit, and more importantly, it looks good. The multiplayer beta didn't really knock my socks off, but this has the appearance of something I'd actually like to play. I've reached out to Bethesda to ask if this is in fact an actual, albeit incomplete, Doom trailer, and I'll let you know what I find out. In the meantime, what do you think—are you more interested in Doom now than you were an hour ago?